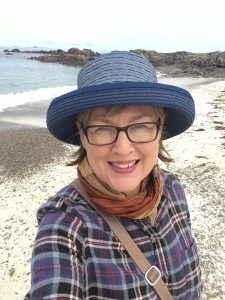 This is a follow-up blog to Pilgrimage Ponderings I, which explains a bit of this journey and what I was doing! 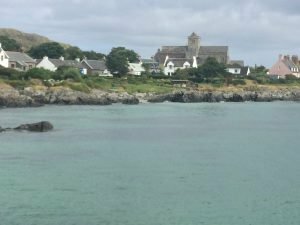 The second leg of my journey this past July brought me to Iona. From Lindisfarne, Iona is quite a journey! I had to take a taxi across the causeway of the Holy Island to a town called Berwick, where I caught a train into Scotland. After two hours of interesting rail travel, I landed in Glasgow and had then to walk through the city to another train station where I caught another train to the west side of Scotland to a small town called Oban. In Oban, I stayed at an air bnb, my first experience at doing something like that! This young couple picked me up from the train station and brought me to their home. I was quite nervous realizing I was spending the night at a stranger’s home, but in the end it was such a gift. Sandra, the wife of this couple, was a pastor with the Presbyterian church and was kind of burned out and needing spiritual support. We talked. 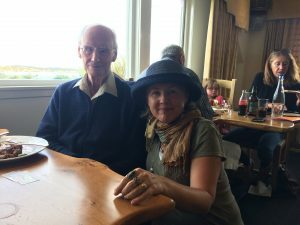 This lovely couple brought me back to town the next morning where I then caught a ferry to the Isle of Mull and caught a bus. Do you see where this is a long journey? And then this bus travelled for 90 minutes on a single lane road. If another vehicle approached, it had to swing to the side and wait until our two story bus continued. There were many head-on possible collisions and I was glad I hadn’t rented a car! This bus then brought me to Fionphorte, a very small fishing village, which runs the ferry to Iona. And so, it came about that I landed on the island of Iona after reading about it for many, many years. 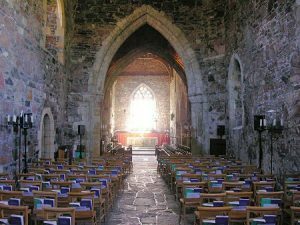 Some of the songs I have taught others have come from the community of Iona and the writings of J.Philip Newell were inspired from his years being the rector here. J. Philip Newell has had a profound impact on my spiritual journey and so there were many reasons why I was filled with anticipation to get to Iona. I landed on the shores of Iona with tears. I had a picture on my fridge for years of the sanctuary of Iona and now as I stood on the ferry from Fionphorte, I knew I was minutes away. A profound longing filled me. 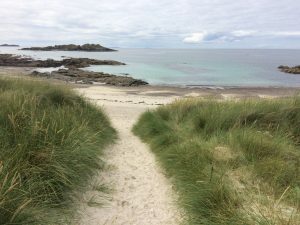 And I realized it was a profound longing for connection; connection with the Celtic church from the past, with others living out of an ecumenical community in the current day Iona community, connection with Divine Love. As I got off the ferry, I first of all found the ruins of the old nunnery. Images of other women dedicated to prayer filled me and I imagined them walking through the door frames of stone that still were before me….who were these women? And then I walked to the old Abbey church. It was filled with other pilgrims like me…with backpacks and…. cameras. Such a glorious space. A sacred space. What were all the memories that these stones held? And somehow, instead of a sense of awe and reverence…..I felt like I was in a tourist site. The sound of voices and the business of cameras and group tours took over the space of old stones and I stood there. I stood there and in the hustle and bustle of the moment, I began to sing. I closed my eyes and the tears fell down my cheeks as I sang a song that was birthed from this island, The Mighty Three. I sang for the stones and I sang for my own heart. And as I sang I became aware of a hush that fell upon the building. All became still. No one moved and no one spoke. No one took a picture. And no one carried on with their tour. For a moment of time we entered into a sacred space. …together. I realize as I look back now, how it is easy to look for a connection with an organization, a place or a person. In Iona I was looking for that and had an expectation for something meaningful to take place. And I had to let my expectations go. My expectations of what something might look like. Over the next two days I tried to connect with the church, with the community…but that connection wasn’t happening in the way I had hoped or envisioned. And so instead I went to the shores. I went to the wind, the sky, the sea and the stones. I lay in the sand with my palms up and surrendered my longing. I surrendered my hopes. I yielded my yearnings. And in that moment on the beach I was at peace. It was enough. I became aware of my own longing to find God in certain places, certain circumstances and certain people. But I had to let go …and when I did… God was meeting me in other ways….through silence, through the beauty of the sea, through the sound of a bird, through the smile of a stranger. And it was complete. I found rest and peace on the shores of Iona. And my last night on that island, as I found my rest and peace, I decided to go for a nice dinner and treat myself for a date with God. A date with Love, the Wellspring in my soul. And so I did. I sat at a table for two and was enjoying a lovely meal in solitude. And sitting kitty-corner to me was an elderly couple. It is too much for me to share all that transpired in that moment – it is still too deep for words to describe. But this elder couple reached out to me and Don, the husband who was an elderly retired Presbyterian 4th generation minister, began to speak into my life in ways beyond my understanding. Without knowing me, without knowing my story, my history or my inner struggle, Don spoke straight to my heart, my soul. He spoke all the things that I was wondering about and then more. He blessed my life. My eyes well up as I write this. The mystery of it all still baffles me. The wonder. The strangeness. Of letting go….and letting God. Old cliché’s coming alive. And the Wellspring within Don overflowed into my heart. Through the air of the sea, through the warm of stone, through the moments of silence, through the heart of a stranger I knew the grace of love once again.